Nico Rosberg held off a charging Daniel Ricciardo to win the Singapore Grand Prix and reclaim the Formula 1 world championship lead. 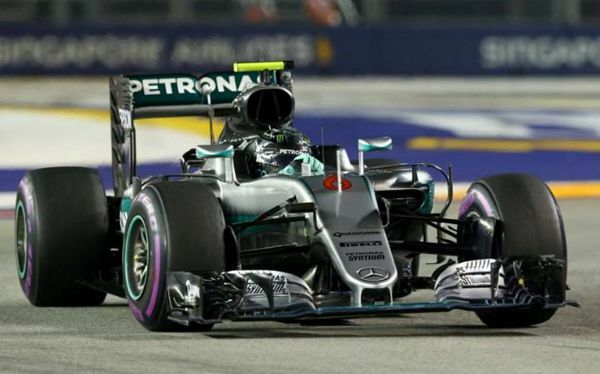 Nico Rosberg of Mercedes claimed victory at Singapore Grand Prix on Sunday night for the first time, which also allowed him to lead the drivers' standings. Rosberg got a good start from the pole position, but the race was not easy for him, as Red Bull's Daniel Ricciardo, and his team-mate Lewis Hamilton as well as Ferrari's Kimi Raikkonen all pushed hard. After a fierce competition, Rosberg finished ahead of Ricciardo, and Hamilton and Raikkonen placed third and fourth respectively. "It's been an awesome weekend," said Rosberg after the race, "Daniel tried to get me there at the end, but really happy. We couldn't come in because of traffic, but it was a cool ending! The whole car was on the edge!" Ricciardo said he is not going to be disappointed. Although things once had looked promising for him, Rosberg was quicker than him during the 58th lap as he got stuck in traffic. "We gave it a good shot and got within half a second," added the Australian driver. Hamilton send huge congratulations to Rosberg, and also confessed that this is really a tough weekend for himself. Fight for the third place between Raikkonen and Hamilton was also very tough. Raikkonen once surpassed the two-time winner in Singapore nearly half of the race, but Hamilton covered the Raikkonen after changing tyres. Sebastian Vettel of Ferrari also fought very hard tonight. He drove from the last position but improved quickly. The German driver, who has won the champion in Singapore four times, finally got the fifth place. Singapore Grand Prix is the Round 15 of the 2016 FIA Formula One World Championship. The two-hour race started on the 5.065-kilometer Marina Bay street circuit, which has 23 corners spread over. The night race was known for being a test given its long duration and the heat and humidity on the tropical island. After Sunday's race, Rosberg has topped this season's driver standings with 273 points, and Hamilton followed with 265 points. Red Bull's Ricciardo ranked third with 179 points. As for the constructor standings, Mercedes has anchored the first place with 538 points, followed by Red Bull and Ferrari, gaining 316 and 301 points respectively.